Tomorrow’s Employees in Careers in Health (Health TECH) is an innovative public health program. Students have opportunities for actual workplace experience. The VHS Health TECH Academy is the first in the country with a Community Health Worker training program! Most importantly, Health TECH provides you real-world experiences and skills that will put you above the competition and prepare you for college and career. 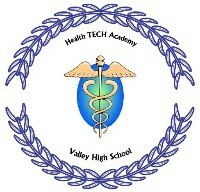 To apply to the Health TECH Academy, see Mr. Black in room F-1 or Ms. Wardlaw in F-3. This pathway is another opportunity to become involved in the medical field. At the end of this pathway students will have all the skill necessary to become a medical assistant or EKG tech. In addition to classroom training, there is also practical field work with internships which are needed to complete this certificate program.